The Animal Welfare Society, incorporated in 1967, is a private, 501(c)(3) non-profit humane society located in Kennebunk, Maine and is a regional leader in companion animal welfare. 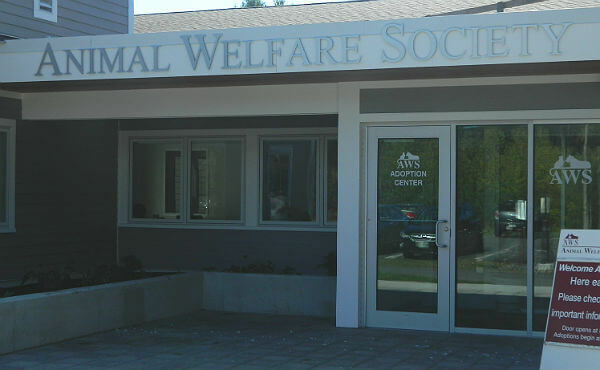 AWS operates a progressive animal shelter and adoption center in West Kennebunk and satellite adoption centers throughout northern New England. AWS’ life-saving community programs include Pets and Women to Safety, Paws in Stripes, Pawsitive Changes and Paws Across America while AWS’ services to the greater community include Youth Programs, Behavior and Training classes, spay/neuter assistance through the Cleo Fund and veterinary and wellness care at the AWS Community Veterinary Clinic. AWS serves as the animal control impound facility for 21 municipalities in York County. In 2018, 4,075 pets received daily care at AWS. In its first full year of operations, the AWS Community Veterinary Clinic provided wellness services, including surgeries, examinations and vaccinations to nearly 5,000 patients, including both resident shelter pets and pets of community members. The clinic’s opening increased AWS’ capacity to provide medical care by 92%, allowing more pets to remain at home with the people who love them. AWS’ community programs – including Humane Education and Canine Training brought education, training and lessons to 2,215 community members. In 51 years, AWS’ capacity to help has grown significantly. In 1967, AWS’ first year, about 500 animals were served; today, that number is well over 10,000. AWS’ operations, adoption center, programs and services are supported by a staff of more than 40 full- and part-time employees and a team of more than 150 dedicated volunteers. Volunteers donate more than 36,000 hours of their time annually in the Adoption Center, in the Veterinary Clinic and in their own homes as foster families. We are able to fulfill our mission through the generosity of those who contribute through financial gifts, in-kind support and bequests. These funds go directly toward the care of the animals at the shelter and to programs that benefit the people and animals in our communities.